This new line is both functional and stylish. The bright lime-yellow used on fire engines is incorporated into a light reflective striping to create a whole new concept in work gear. 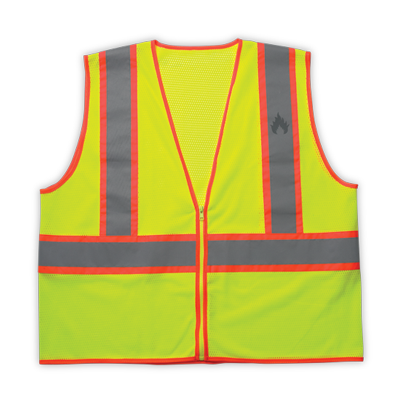 A superior quality, ANSI Class 2 rated, safety vest made with fire retardant material, has 2" wide retro-reflective stripes, a zipper front closure, and meets the ASTM D-6413 FR standard. When in doubt choose the next higher class rating as posted speed limits do not always reflect normal traffic conditions. Always maintain a safe distance from traffic and operating equipment.